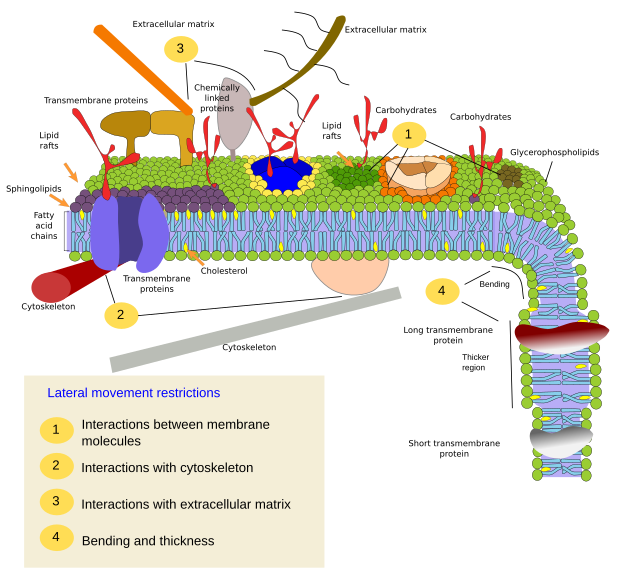 In this page, we are going to highlight the main proposals and models that have shaped the current model of the cell membrane that is described in cell biology books. The cell as an entity has no meaning without membranes. They set the limits of the cell and its intracellular organelles. Furthermore, many cellular functions are carry out by membranes. However, cell theory was proposed without being aware of the existence of membranes. Only at the beginning of the 20th century, membranes were regarded as necessary for the cell. In fact, the concept of cell membrane was not very popular until the early 20th century. Initially, the word "membrane" was used for naming the plant cell wall together with the peripheral cytoplasm, which were difficult to observe by using seventeenth and eighteenth century microscopes. An important breakthrough was done when researchers realized that cell wall could be removed from the rest of the cell. Thus, plant cells do not need the cell wall to be alive. This observation was also important to bring animal and plant cells to same level. The discovery of the cell membrane structure, that is, how molecules are arranged, have run in parallel with the discovery of the molecular components, their properties, as well as the technical advances of electron microscopy and laboratory experiments (Figure 1). At the beginning, it was thought that cells were delimited by a layer of unknown features, which described as the limit of the protoplasm. Figura 1. Timeline of the main proposals about cell membranes. (Adapted from Edidin 2003). The first serious suggestion about membrane composition was made by C.E. Overton in 1895 (Figure 2). He posed that the exchange of molecules between plant cells and the environment does not depend on the cell wall, and also observed that lipids enter the cells more easily than charged molecules. Therefore, he claimed that there is a cellular limiting barrier, or coat, made of lipids. He even suggested that this barrier was composed of cholesterol and other lipids. The cellular lipid barrier was first mentioned around 1880, but C.E. Overton's studies showed consistent support. I. Langmuir observed that amphipathic lipids, which have a hydrophilic head and fatty acid chains, form a monolayer on the surface of water: the head in contact with the water and fatty acids outside the water. Thus, they are arranged as a lipidic monolayer (Figure 2). This was an important idea for later models of the cell membrane because amphipathic lipids such as glycerophospholipids and sphingolipids are the main components of cell membranes. Back then, the outcomes of electrophysiology studies on neuronal axons showed that cells have ions and electrochemical gradients exist thanks to cellular semipermeable "envelopes". These "envelopes" can be crossed by ions in a regulated manner. Around 1925, E. Gorter y F. Grendel wanted to know how many lipids an erythrocyte has. They found that lipids extracted from erythocytes, which have no other membrane but plasma membrane, formed a monolayer in the water surface with an area two times larger that the estimated surface of the erythrocyte. They concluded that there were double area of lipids as a monolayer that the surface of the erythrocyte, that is a 1:2 ratio. It looks like they made many errors during the experiment, by luckily enough, some errors compensated other errors. More precise studies found later a relation of 1:1,3. This 0,7 is because of the transmembrane proteins of the erythrocyte plasma membrane. At that time, researchers were not aware of the existence of these proteins. Anyway, the results they got led them to propose that lipids were organized as a bilayer (Figure 2) on the surface of the erythrocyte, with the heads toward the water, either extracellular or intracellular, whereas the fatty acids remained in the interior of the membrane, protected from the water environment. They had just described the bilayer model of cell membranes, which explained many chemical features, and at the same time it was a stable molecular organization according to the thermodynamic laws. The model agreed with the thickness of cell membranes (4 nm) estimated by H. Fricke in 1920-1930, by studying membrane capacitance. This lipidic bilayer model was the base for later adjustments and models of the cell membrane organization. In the 1930s, new observations provided deeper insight on the physical properties of membranes, like surface tension, permeability and electrical resistance. It came out that the results could not be explained just by a lipid bilayer. For instance, it was found that some molecules could cross cell membranes more easily than expected according to their chemical nature, so they must had some kind of help. Proteins were introduced as part of the membranes to explain these apparently odd results. H. Davdson y J.F. Danielli proposed a trilaminar model of the cell membrane by adding proteins to the lipid bilayer (Figure 2). They thought that proteins were covering both surfaces of the lipid bilayer, but fulfilling the thermodynamic laws at the same time. Figure 2. Models of the organization of cell membranes. (Modified from Becker et al., 2003). Nobody was able to be sure about how cell membranes were organized until they were visualized at electron microscopy, which happened in the 1950s. The trilaminar model of Davson and Danielli was supported by transmission electron microscopy images. Although electron microscopy was used around 1930, sharp images of cells were not obtained until the 1950s. During the following decades, images of membranes in transverse view were clearly visualized having three lines: dark, light and dark. This dark-light-dark pattern was observed in every cell membrane and every cell type. Thus, it was called the unit membrane, considered as a universal organization for all cell membranes. The thickness of the membrane was measured: 6–8 nm. J. D. Robertson (1960) suggested that the two dark lines corresponded with proteins associated to the surfaces of the membrane (hydrophilic surfaces) and the light line with the lipid fatty acids. However, when artificial membranes were assembled and observed at electron microscopy, the same characteristic dark-light-dark pattern was visualized, even if there were no proteins. Davson and Danielli's model, which was popular until the 1960s, coexisted with other models. These models changed a bit the position of lipids and proteins, but proteins were always covering the surface of the membrane. However, they did not convincingly explain how ions and other charged molecules could cross the cell membranes. In 1966, Green and Benson were studying mitochondrial liposomes. They could extract portions of lipids and proteins together, as units, and suggested that some globular proteins could be dissolved in lipids. By that time, it was also suggested that some proteins could extend across the membrane thickness working as channels. These results were obtained thanks to advanced laboratory techniques that allowed the separation of different types of membranes. Thus, components of each membrane could be studied separately. Researchers realized that membranes were rather diverse regarding their molecular composition. For example, the percentage of proteins could range from 50 % to 80 %. On the other hand, many proteins were rather insoluble in water so that it was difficult to explain the peripheral location. That is, membranes had many proteins and it was quite improbable that all of them were peripheral. Many proteins were therefore part of the inner region of membranes with hydrophobic amino acid chains inserted among the fatty acid chains, and hydrophilic portions on the surfaces of the membrane. Since 1945, the view of proteins extending across the membrane thickness was benefited from the studies with ions. From these experiments, it was suggested that the generation and maintenance of ion gradients across the membranes were due to protein pumps that moved ions from one side to the other of the membrane, with energy consumption. Around 1965, it was found that ATPases were associated to membranes. These protein complexes use ions to produce ATP, so they have to be transmembrane proteins. There were other issues like, why some sugars are more easily incorporated to the cells than others? Why was the incorporation of molecules to the cell saturated? These questions could be answer if transmembrane proteins were considered. During the 1970s, two lines of research showed evidences of transmembrane proteins. One was the development of the scanning electron microscopy. In 1963, Moor and Mühlethaller developed the cryofracture technique for electron microscopy. A few years later, some structures were observed in the interior of membranes, and they can not be anything else but proteins. The other line was molecular studies. In 1996, some studies showed that no all membrane proteins were globular. Instead, some could have more elongated 3D structures that make them suitable to be inserted in the membranes. Two domains of the same molecule could be distinguished, one was intracellular and the other was extracellular. This fact could only be explained if the molecule was stretched the whole plasma membrane width. In 1972, S.J. Singer and G. Nicolson (Science 175: 720-731) gathered the results published during the previous decade: the flip-flop movement was very rare for lipids, and almost notexistence for proteins, the lateral diffusion was common for lipids and proteins, membrane were semipermeable, both globular and transmembrane protein may contain alpha helix amino acid chains, the phase transition of membranes, and the influence of lipids in the activity of some enzymes. Singer and Nicolson fitted all these data in the fluid mosaic model of cell membrane (Figures 2 and 3; see Figure 1 of Nicolson 2014). One of the major strengths of the model is that it is based on thermodynamic laws, electro-chemical interactions between molecules, to explain the organization of membranes. It means that the model not only is explaining the membrane organization, but also can predict membrane properties. In the model, membranes are constituted by proteins embedded in a lipid bilayer. That is why the model contains the word mosaic. Thus, proteins are incorporated into the bilayer and have intracellular and extracellular domains. This is crucial because proteins can establish communication gateways between intracellular and extracellular environments in several ways: forming hydrophilic channels, working as transporters that bypass the fatty acid chain barrier, or as receptors that transmit information through structural conformational changes after an appropriated signal is recognized. Peripheral proteins, which can be associated with the membrane surface by electrical forces or can be chemically linked to some membrane molecules, were included in the model. Singer and Nicolson suggested that lipid-protein interactions could influence the function of membranes (and therefore cells). Another conceptual breakthrough was the membrane fluidity, a property that had been glimpsed in previous studies. H. M. McConell and D. Chapman performed magnetic resonance experiments and showed that both lipids and proteins were not motionless, but could move laterally within the bilayer by diffusion. Therefore, the membrane became a dynamic and malleable structure. In addition, in these experiments, membrane was suggested being asymmetric, meaning that the cytosolic monolayer had different composition than the outer monolayer. The fluid mosaic model explains many experimental results coming from more current techniques. For example, selective labeling of molecules and real-time tracking of their movements with fluorescence microscopes have allowed the study the behavior of single molecules in membranes under more or less physiological environments. It has been proven that molecules can move laterally in membranes, and that they are not usually in fixed positions. Quantitative spectroscopy has also supported that movements are mostly lateral, that is, movements as if molecules were floating in the lipid bilayer. However, changes from one monolayer to the other (flip-flop movements) are very infrequent. Currently, the fluid mosaic model has been adjusted to explain new experimental data. It turns out that a major feature of membranes is lateral heterogeneity (Figure 3). Thus, after in vivo and in vitro single molecule tracking, it has been found that molecules do not show completely random movements, that is, movements are constrained. These restrictions clearly observed for proteins. Recently, restrictions on lipids have also been found, mainly affecting sphingolipids and cholesterol. Thus, although cell membranes behave according to the fluid mosaic model, where molecules diffuse laterally and freely, the movements may be subjected to some restrictions. These restrictions can be physico-chemical interactions between membrane molecules, interactions with the cytoskeleton and extracellular matrix, and restrictions depending on the physical properties of the membrane itself, mainly thickness and bending. All these constrains work together to render a non-homogeneous membrane where some types of molecules are grouped in regions that form the so-called membrane domains. Each domain has a differential molecular composition that can carry out specific functions. Hence, the current view of cell membranes is based on the fluid mosaic model, but the fluidity feature does not lead to a chemical homogeneity but to a set of domains distributed through the whole membrane extension. These domains are very plastic structures and the position, the number, the size (about nanometers) may change in short time periods, depending on the functional needs of the cell. They can also appear and disappear. Paradoxically, fluidity favors the formation and dynamic of these domains. Figura 3. Modelo de membrana heterogénea, indicando las principales causas de esa heterogeneidad . New studies and more advanced techniques will probably provide new data for redrawing membranes in a different way as they appear in the current textbooks. Some new proposals are on the table. More proteins. In the current membrane drawings, proteins are scarce and scattered among lipids. However, membranes are full of proteins which are interacting between each other. On average, membrane have about 50 % of proteins (in weight). It is estimated that the ratio protein/lipid is 1/40 (in molecules). Due to the small size of lipids, it is though that there is a distance of about 2 nm between proteins. Actually, membrane proteins may aggregate in large molecular complexes. The interactions of these complexes with the cytoskeleton, extracellular matrix, and between each other, may constitute a scaffolding for the membrane itself. Irregular thickness. It can be guessed that evolution found the way to get membranes where lipid fatty acids (from the two monolayers) fit perfectly well with the length of the hydrophobic domains of transmembrane proteins, but this is not the case. There are transmembrane proteins with hydrophobic regions of different lengths. The protein hydrophobic domains are isolated from the water environment by lipids with appropriated fatty acid lengths. Therefore, proteins with long hydrophobic domains are surrounded by lipids with long fatty acid chains. It means that there are regions in the same membrane with different thickness (Figure 4). Figure 4. Membrane domain with higher thickess. Asymmetrical surfaces. Atomic force microscopes can be used to study the surface of membranes at nanometer resolution range, even with free moving molecules. Interesting data has been got after studying the erythrocyte membrane with this type of microscope. For example, the outer surface is quite smooth, which means that neither the glycocalix nor proteins protrude much from the hydrophilic lipid heads. Therefore, the outer surface would be a thin hydrophilic layer made up of lipid heads, extracellular protein domains and carbohydrates. However, the inner surface is much irregular, which may be caused by the intracellular protein domains (Figure 5). Figura 5. Erythocyte membrane model. Adapted from Wang et al., 2010. A similar methodology in eukaryote cells has revealed that proteins are really abundant and occupy most of the surface of the plasma membrane. The extracellular domains of proteins are about 4 nm above the heads of the lipids. There are so many proteins and so packed that they form a highly homogeneous cell surface, as an external protective barrier basically composed of proteins. Areas rich in cholesterol can be detected and sugars seem to concentrate in microdomains on the extracellular surface. Transmembrane proteins are asymmetrically placed in the plasma membrane, with a much larger domain in the cytosol. In fact, the cytosolic domain of transmembrane proteins extends about 10 to 12 nm from the lipid heads. Associated cytosolic proteins are concentrated in microdomains enriched in cholesterol. These microdomains are separated about 13 to 105 nm from each other, and are about 53 nm in size. Knowing that the lipid bilayer is about 4 nm thick, the total plasma membrane thickness is about 20 nm (Figure 6). Furthermore, transmembrane proteins are usually associated in groups. These groups may work as platforms that boost molecular interactions and, therefore, increase the signal transduction efficiency. Figure 6. Plasma membrane model of eukaryote cells. Modified from Zhao et al., 2014. Alberts A, Johnson A, Lewis J, Raff M, Roberts K, Walter P. 2007. Molecular Biology of the Cell. 5th editon. Garlan Science. ISBN: 9780815341055. Bagatolli LA, Ipsen JH, Simonsen AC, Mouritsen OG 2010. An outlook on organization of lipids in membranes: Searching for a realistic connection with the organization of biological membranes. Progress in lipid research. 49: 378–389. Becker WM, Kleinsmith LJ, Hardin J, Raasch J. 2003. The world of the cell. 6th. San Francisco: Benjamin Cummings. ISBN-10: 0321716027 ISBN-13: 9780321716026. Edidin M. 2014. 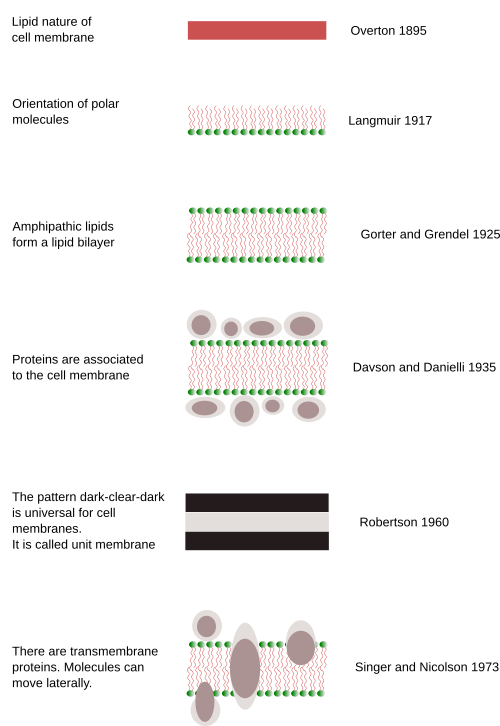 Lipids on the frontier: a century of cell-membrane bilayers. Nature reviews molecular cell biology. 9:32. Engelman DM. 2005. Membranes are more mosaic than fluid. Nature. 438:578-80. Lombard J. 2003. Once upon a time the cell membranes: 175 years of cell boundary research. Biology direct. 4(5), 414-418. Nicolson GL. 2014. The Fluid—Mosaic Model of Membrane Structure: Still relevant to understanding the structure, function and dynamics of biological membranes after more than 40years. Biochimica et Biophysica Acta (BBA)-Biomembranes. 1838(6), 1451-1466. Pollard TD, Earnshaw WC, Lippincott-Schwartz J. 2007. Cell biology. 2th edition. Saunders Elsevier Inc. ISBN: 978-1-4160-2255-8. Wang H, Hao X, Shan Y, Jiang J, Cai M, Shang X 2010. Preparation of cell membranes for high resolution imaging by AFM. Microscopy. 110: 305-312.